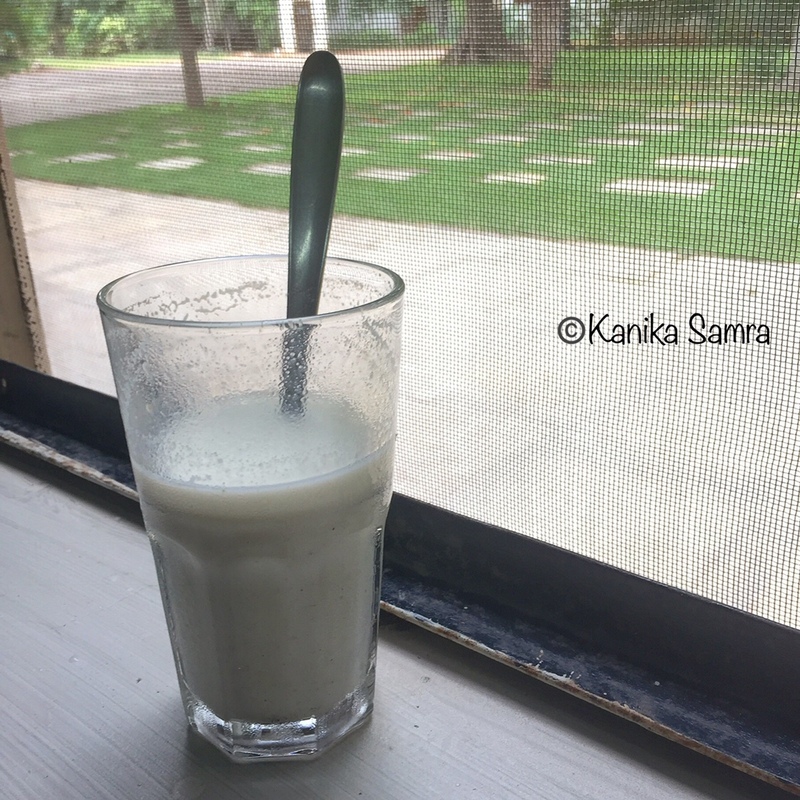 As the name suggests, Thandai – a cooling drink, is ideal for summers. The festival of Holi falls in the spring, just when the plains of northern India are shrugging off the cold and welcoming sunny, bright days. The switch over from mild, foggy days to strong sunshine is often stark and overbearing. That’s when a glass of cool Thandai can work wonders. Thandai is made with a mix of nuts, seeds like poppy and muskmelon, spices like cardamom and black pepper and lots of sugar. The result of these ingredients is a sweet, mildly spiced drink that instantly cools the body. As I continue to learn more about ingredients the idea of “तासीर” is becoming more and more apparent. “तासीर” (Ta-seer), Urdu for nature or characteristics of a substance, is often talked about in Indian households where home remedies are the first course of action. So if you get dehydrated and hot, the advice you will receive is to drink or eat things with a cooling taseer. There is an equivalent of the same in Ayurveda, “Virya”, which is defined as the potency of a substance and its effect- heating or cooling – on the body during digestion. During my childhood our refrigerator would always have a bottle of store-bought Thandai concentrate that my brother and I polished off making glass after glass of Thandai mixing a tablespoon (or more for sweetness!) of the concentrate with either cold milk or equal parts milk and water. So here goes! Make sure you bookmark this quick and easy recipe for Holi. Equal parts chilled milk and cold water. Adjust according to taste. To begin measure all ingredients into separate bowls. Then soak the seeds and nuts — almonds, cashews, poppy seeds, magaz (muskmelon seeds) in hot water and keep aside for a few minutes. The idea here is to gently cook these ingredients and also blanch the almonds. Once the temperature declines and it’s easy to handle, slowly start removing almond skins and add them to your food processor. Small jar will work better. Drain excess water from the other soaking ingredients and grind into a fine paste. If the mix is too dry and doesn’t blend, add 1 tablespoon of water at a time until you can get it going. Next, in a coffee grinder or a dry food processor jar, grind fennel seeds and cardamom pods. You can choose to buy cardamom powder or make your own. I describe two ways of grinding cardamom here. Either grind cardamom with the outer shell or use on the seeds. After this, put a deep and heavy bottomed saucepan on the stove on medium high heat. Add sugar to it along with 1 cup of water and let it cook until 3/4ths of the sugar dissolves. Keep stirring to prevent sugar from caramelizing and burning. This mix will become a thick, granular syrup. To this add the paste we made in step 1 along with the powder from step 2 and crushed black pepper. Mix in well and let it cook on low heat for a few minutes ~ 5. If you find it hard to stir, add additional water, only a 1/4 cup at a time. After 5 minutes of stirring, turn off the heat and strain through a sieve into clean glass jars that are airtight when closed. It will be slightly hot, be careful while handling. But if you wait too long and let it cool down then it will become a semi-solid mix that will not pour. For an indulgent thandai with some added colour, add Saffron while the mix is still warm. As it ages, the colour will deepen. Once in jars, leave lids open to cool. Cover the mouth of the jar with a thin muslin cloth or a mesh food cover. Thandai concentrate is ready! When the jars are cool to touch, close and store in the fridge. These will easily last one month. Thandai, as the name suggests, is a cooling drink that is perfect for summer months. It is made with a combination of nuts and spices, and lots of sugar. This simple recipe gives you a concentrate that can be kept refrigerated for up to a month. Measure all ingredients into separate bowls. Soak the seeds and nuts in hot water and keep aside for a few minutes. Once cool, remove almond skins and add almonds to your food processor. Drain excess water from the other nuts. Add to the processor and grind into a fine paste. If the mix is too dry and doesn’t blend, add 1 tablespoon of water at a time until you can get it going. In a grinder grind fennel seeds and cardamom pods. Put a deep and heavy bottomed saucepan on the stove on medium high heat. Add sugar to it along with 1 cup of water and let it cook until 3/4ths of the sugar dissolves. Keep stirring to prevent sugar from caramelizing and burning. To this add the paste from step 1 along with the powder from step 2 and crushed black pepper. Mix in well and let it cook on low heat for a few minutes ~ 5. After 5 minutes of stirring, turn off the heat and strain through a sieve into clean glass jars that are airtight. For colour, add Saffron while the mix is still warm. Once in jars, leave lids open to cool. Cover the mouth of the jar with a thin muslin cloth or a mesh food cover. When the jars are cool to touch, close and store in the fridge. These will easily last one month. To drink, add one tablespoon of concentrate to a glass of chilled milk. Add water if you want to make a lighter drink or more concentrate for a sweeter one. You can choose to buy cardamom powder or make your own. I describe two ways of grinding cardamom here. Either grind cardamom with the outer shell or use on the seeds. If you find it hard to stir, add additional water, only a 1/4 cup at a time. Once the syrup is read - be careful while handling, it will be hot. But if you wait too long and let it cool down then it will become a semi-solid mix that will not pour.